By the Middle Triassic, a great crack had opened between Africa and the continent we can now call Eurasia, and a long arm of the Tethys Sea reached westward along southern Russia into what is now Germany and France. The lands of today's South Asia remained islands, largely submerged and well to the south of Eurasia. They formed the long Cimmerian ridge, which was drifting northward, separating the Old Tethys to the North, from the New Tethys, between the Cimmerian Ridge and Gondwana. These blocks had crumbled off the north coast of Gondwana in the first spasm of the tectonic shake-up which would destroy the world-continent of Pangaea by the end of the Mesozoic. The two Chinese cratons formed an irregular and incomplete eastern border to the Old Tethys, merging with the Cimmerian Ridge in the Southeast. Directly across the Old Tethys, almost at right angles to the Cimmerian ridge, another fracture was also propagating westward, tearing Africa from Gondwana. In the far West and far South, however, little had changed. South America and Africa merged seamlessly together. India and Australia remained firmly attached to Antarctica in eastern Gondwana. The geological strains in the west were beginning to show in a series of undramatic fault valleys which tracked the old suture uniting Africa and Laurentia (Stanley, 1998), but the Atlantic Ocean was still far in the future. Laurentia and Eurasia still met in the north. A cool boreal ocean lay north of that landmass, surrounding the North Pole. At earlier times, the boreal ocean had sent a long finger south, forming a shallow sea between Eurasia and Siberia/Kazakh, sometimes even reaching the Old Tethys. But the merger of Eurasia and Siberia, with the rise of the Urals, had severed this antique connection. From Norway to the Lena River, the north coast of Eurasia was beginning to acquire its modern contour. The Early Triassic recovery had been fitful and inconsistent. The Middle Triassic marks the return of better conditions for the whole biosphere, as well as the global radiation of a number of key groups which would dominate the remainder of the Mesozoic. Stanley (2003a); In the long run, perhaps the most important of these changes was the least conspicuous. The Middle Triassic saw the beginnings of the modern phytoplankton assemblage that forms the base of the entire marine food web. Falkowski et al. (2004). These included the first clearly identifiable dinoflagellates, which are found as organic walled cysts preserved in Middle Triassic continental margin sediments. Katz et al. (2004). The recovery of reefs remained slow and sporadic, although increased ocean oxygen circulation now permitted some permanent gains. Stanley (1998). These gains were accomplished by calcareous sponges and mineralizing bacteria -- generally the first reef-builders to recover from disaster. 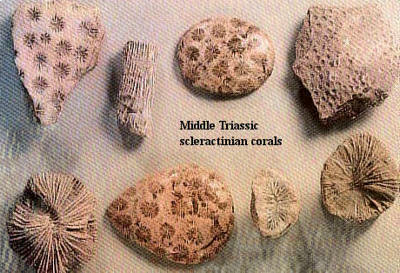 However, further off-shore, particularly in the vast shallows around China, the first scleractinian corals had appeared. These animals formed small mounds no taller than 3m in the Middle Triassic Stanley, 1998; Stanley 2003a), but they became a variably important element of reef communities from that time forward. While calcitic sponges did reasonably well, most other sponges, radiolarians, and all other organisms built on silicate skeletons, did very poorly. Bilaterian animals recovered more slowly and less steadily. Several groups of crustaceans diversified (isopods, decapods). Others became extinct, including the problematic euthycarcinoids (Vaccari et al., 2004). Among mollusks, belemnites and various other neocephalopods appeared. Benton & Harper 1997). Gastropods became larger, but their total diversity may not have increased much above Early Triassic levels. Payne (2005). Conodont diversity declined, but the surviving species remained ubiquitous until the end of the Triassic. Middle Triassic fishes were largely of neopterygian grade. In fact, even the more derived clades of neopterygian fishes (pycnodontiforms, pachycormiformes) are not known until the Late Triassic. The most significant event among fishes may have been the first appearance of neoselachian sharks (depending on how one defines the Neoselachii). Cuny et al. (2001); Maisey (1984). The most famous marine organisms of the Middle Triassic, however, weren't fishes at all, but diapsid reptiles. The Middle Triassic was the epoch in which ichthyosaurs, placodonts, pachypleurosaurs, and nothosaurs all flourished. All of these groups evolved in the Early Triassic, but seem to have found the Middle Triassic European Tethys Seaway particularly congenial. In fact, the placodonts, pachypleurosaurs, and small nothosaurs are not often found in any other place or from any other time. Carroll & Gaskill (1985); Carroll (1988); Sander (1989). The Plesiosauria may well have been evolved nothosaurs, but the particular anatomical characteristics of plesiosaurs (including their great size) are not found until later in the Triassic. Carroll & Gaskill (1985). In addition to these reptiles, a few species of trematosaurid temnospondyls remained, at least some of which were marine. Steyer (2002). The plant cover of the Middle Triassic continued the recovery begun in the Olenekian. Commonly encountered large plants included sphenopsids, ferns, seed ferns, conifers, and cycads. Labandeira (1998). 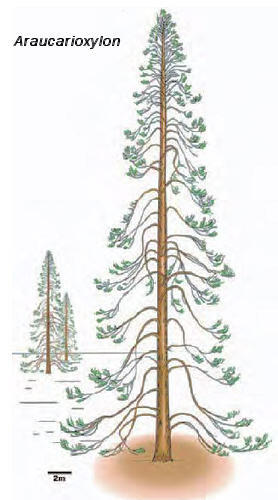 The conifers, in particular, radiated strongly, covering broad areas with open pine forests. This remained the general pattern through the remainder of the Triassic and Jurassic Periods. Dipteran insects had appeared in the Early Triassic. They radiated with the recovery of the terrestrial plants; and the Middle Triassic saw the divergence of the fruit fly and mosquito lineages. Benton & Donoghue (2007). Other herbivorous insects also established themselves in the new forests, such as beetles, hemipterans, and an unknown insect which left cicada-like burrows. Labandeira (1998). Temnospondyl amphibians remained an important element in swamp and fresh water settings, including types remarkable for large size (mastodonsaurs) or bizarre appearance (plagiosaurs). Damiani (2001); Warren (1995). The earliest known turtle remains are also found in the Middle Triassic, and the existence of basal frogs and salamanders is likely. 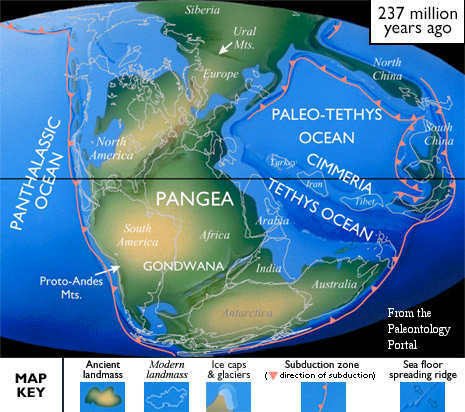 However, the vast, dry inland areas of Pangaea favored a completely different fauna, known from localities like Ischigualasto and Los Chañares in South America. Lucas 1998); Sereno 1991). In such places, the early archosauromorphs evolved, including proterosuchids, erythrosuchids (Sereno, 1991), proterochampsids (Benton, 2004a), and others "whose obscure and uncouth names would only serve to oppress the memory and perplex the attention of the reader" (Gibbon, 1776). As Benton points out, the basal members of the Archosauromorpha were never numerous or widespread, with the outstanding exception of the rhynchosaurs (Carroll, 1988). However, by the Ladinian this lineage had produced the Crocodylomorphs and the Dinosauria. Sereno (1991). These last were instantly (in a geological sense) successful. By the end of the epoch, the archosaurs had replaced synapsids as the dominant tetrapod group in terms of both biomass or diversity. Therocephalians became extinct. Dicynodonts began to decline, after a minor radiation which produced forms such asKannemeyeria. Rubidge & Sidor (2001). However, a number of advanced cynodont groups, such as the probainognaths and tritylodonts continued. These groups began to converge toward forms of smaller size and simpler skull construction (Sidor, 2001), a trend which eventually produced the mammals.